cloud is gone and tifa has passed on from a mysterious illness so barret took in their two children rathion and sianthia. when the two turn 18 sianthia joins barrets unit known as m.s.t.s (midgars special tactics squad). barret decides to do something he never thought he'd do and send rathion to shinra to become a soldier. meanwhile squall and rinoa send their son hyrun off to the same school knowing that something is big is on the way. 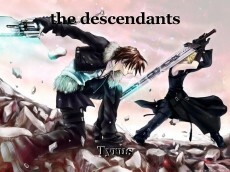 after a year of training zell turns up in shinra looking for hyrun to inform him that his parents were captured by a mysterious being and that the garden has been destroyed... so hyrun decides to leave and rathion decides to join him to save his parents.... will the two warriors be able to fill in for their parents and stop what is coming? Later on they meet up with two more allies known as Crystal and Tiasha who are greatly skilled and they decide to join Hyrun and Rathion on their mission to save Hyruns parents. However they find out that someone else is in the way and they will be shocked to find out who this mysterious person. This page was created in 0.5226 seconds.